Rockstar Editor Contest: Music Video for "Wanderer"
In the first Rockstar Editor contest open to all three platforms, PC players will now be up against the talented hordes of creators on PS4 and Xbox One. 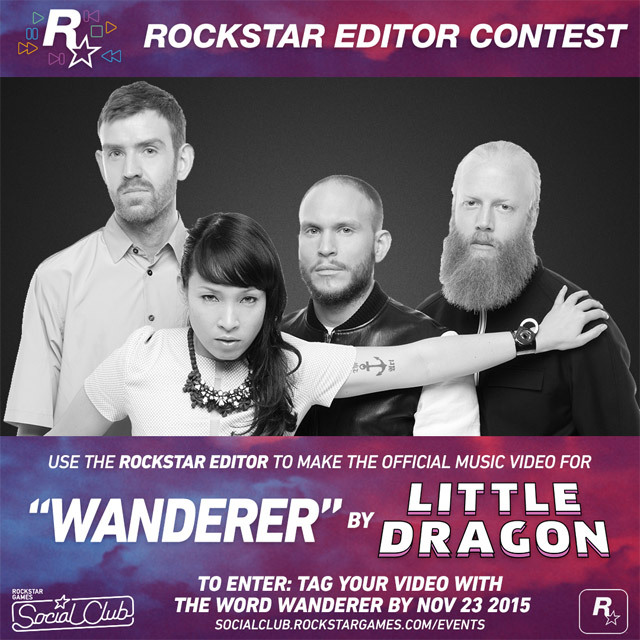 With increased competition and an incredible pack of prizes for the winner, everyone will need to be on top of their game to have their video chosen as the official music video for Little Dragon's "Wanderer" off the Welcome to Los Santos soundtrack. 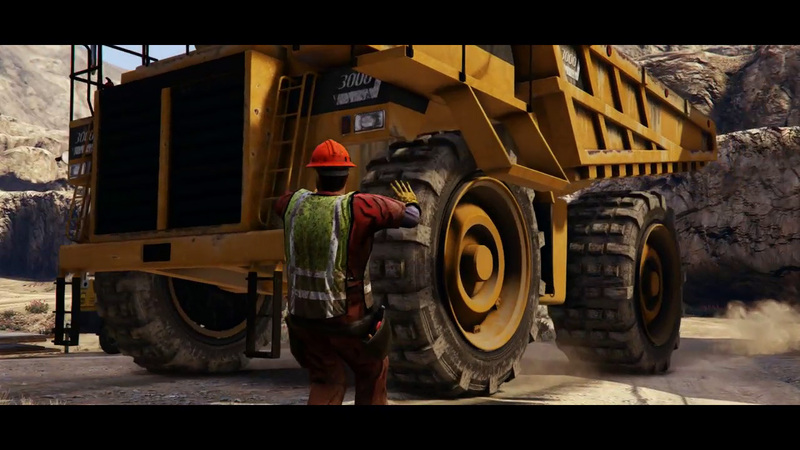 As well as being open to three platforms, this is also the first Editor contest in which players can take advantage of the new Rockstar Editor features released in the Freemode Events Update - including Sound Effects, Ambient Tracks, refined Clip Management and more! Entrants are challenged to create a music video using the Rockstar Editor telling the story of a rogue - a very clever double-agent or double-crosser who plays two sides of a criminal enterprise to her or his own advantage. You may have heard the track on the Alchemist & Oh No Present: Welcome To Los Santos album and the new in-game radio station The Lab, you'll want to know it inside out to ensure your visual accompaniment is pitch perfect. To get you thinking about your own interpretation, here's the track for you to listen to. As well as the prestige of having your opus selected as the track's official music video, the grand prize winner will receive an incredible pack of prizes including a gold game controller (with real 24K gold paint) customized with your personal Social Club ID. The winner can choose between an Xbox One or PS4 controller, or a G510 Proteus Core Gaming Mouse featuring 11 programmable buttons, customizable weight and five selectable DPI settings, from headshot-precise 200 DPI targeting to lightning-fast 12,000 DPI maneuvers. Not only that but the winning director will also be able to craft their next masterpiece from the comfort of a Rockstar Editor branded director's chair, also featuring your personal Social Club ID - a throne fully befitting a champion. Finally, the rare and coveted GTAV Varsity Jacket will also be sent your way - featuring a special custom patch touting your status as a Rockstar Editor letterman for the world to see. Two runners-up will each receive a $100 Rockstar Warehouse gift card and a deluxe prize pack of official GTAV gear and will also be featured at the Rockstar Newswire. The video must feature the song "Wanderer" by Little Dragon as its soundtrack, and only that song. Your video must be between 4 and 5 minutes in length. 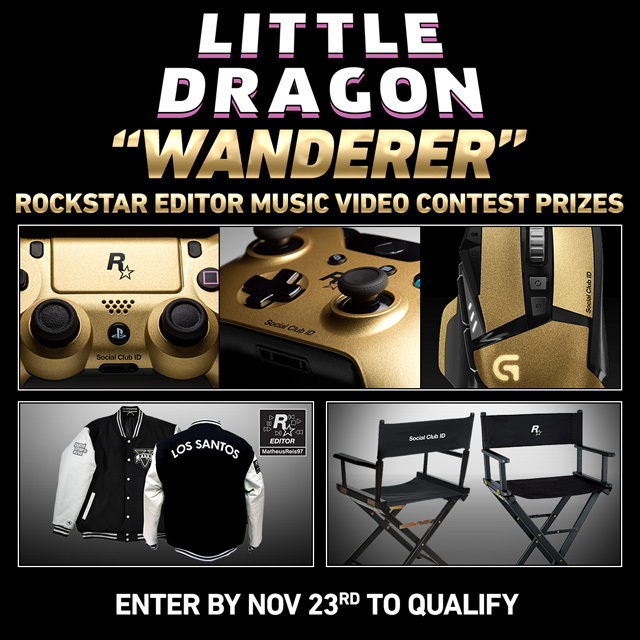 The video must be published to Rockstar Games Social Club and tagged with the word 'wanderer' between now and 11.59pm ET on November 23rd to be eligible. The video must be made entirely using the Rockstar Editor. We know that many advanced Rockstar Editor video creators like to use additional third party editing software but in order to keep this competition fair for all entrants, we require that you only use the Rockstar Editor in producing the video. Little Dragon and Rockstar Games will pick the winning clip taking into consideration adherence or interpretation of The Creative Brief mentioned above, entertainment and artistic value, editing quality and overall creativity. Watch the Social Club contest page to see how other Social Club members think your clip stacks up against the competition and stay tuned for the winners announcement later this fall. Void in certain countries and where prohibited. See official rules and eligibility details.